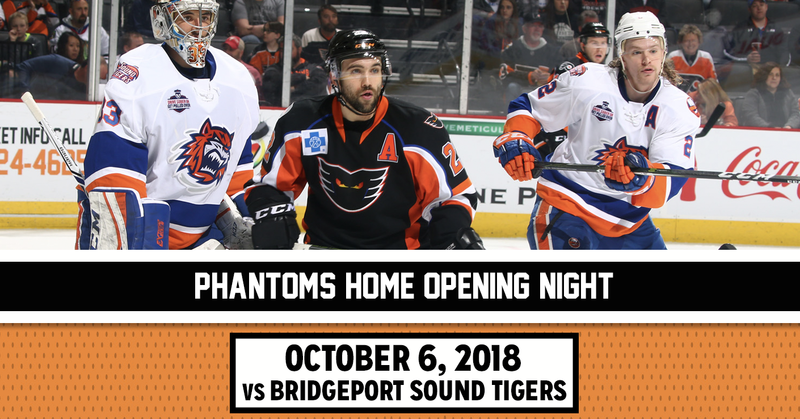 Lehigh Valley, Pa. — The Lehigh Valley Phantoms, proud AHL affiliate of the Philadelphia Flyers, will begin the home portion of their 2018-2019 regular season — the team’s Fifth Season in the Valley — on Saturday, October 6 at 7:05 p.m. against the Bridgeport Sound Tigers, primary affiliate of the New York Islanders. Lehigh Valley’s Home Opener will be one of three head-to-head meetings against Bridgeport in downtown Allentown this season and one of six total showdowns between the two Atlantic Division clubs. 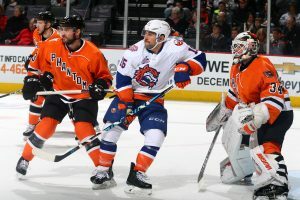 During the 2017-18 season, the Phantoms produced a record of 7-1-0-0 against the Sound Tigers in a series that saw the Phantoms take the first five consecutive games. The complete schedule for the 2018-19 regular season will be released on Wednesday, July 11. Season tickets offering a wide range of benefits as well as 20-game and 12-game plans for the 2018-19 season are available now by calling the Phantoms office at 610-224-GOAL (4625). The upcoming campaign marks the Phantoms’ fifth season playing at PPL Center in Lehigh Valley so be sure to take part in the Fifth Season celebration! Hockey will return to PPL Center with the fourth annual Flyers in the Valley preseason game on September 21, 2018 when the Philadelphia Flyers tangle with the New York Islanders. Starting at just $18 for group tickets and $22.50 for single game buyers, tickets for the Flyers preseason showdown are on sale to the general public at PPLCenter.com or at the QNB Box Office at PPL Center located at the corner of Seventh and Hamilton.